Calling existing water quality protections outdated and inadequate, Gov. Jay Inslee today announced stronger proposed clean water standards with hopes of raising safe fish consumption levels from the currently recommended one serving a month to closer to one serving a day. Inslee says additional protections would allow the state to raise the current consumption standard from 6.5 grams a day to 175 grams a day, without any significantly increased cancer risk from pollutants in regional waterways. 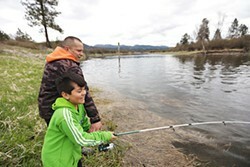 Ray Pierre, vice-chair of the Kalispel tribe, fishes along the Pend Oreille River with his family. The Governor’s Office stated the current standards go back to 1992 when most major water pollution stemmed from large discharge pipes. New standards need to address chemical runoff or more nuanced toxin sources. The Inlander wrote last year about the impact of fish consumption on American Indian communities, which traditionally rely more heavily on fish as part of their diet. Much of the public debate has resulted from coverage by InvestigateWest. Washington-based businesses, including Boeing, have opposed changes to the fish consumption rate, arguing against increase environmental regulation. Inslee has asked the Department of Ecology to develop draft regulations by Sept. 30 with hopes to introduce a bill on the issue next year. UPDATE: Boeing issued a statement this afternoon via Tim Keating, senior vice president of Government Operations, emphasizing the company has a long history of supporting environmental protections that ensure human health and environmental welfare.